Great location with a relaxed atmosphere and very clean in all areas of the hotel. Friendly and helpful staff giving excellent service especially in the main restaurant. Great beach and swimming pool always very clean, great for children. Beautiful well maintained garden areas and good outdoor play area for children. Nice outdoor bar to sit out in the evening and watch the daily entertainment on offer whilst having a drink. Good beach bar serving snacks during the day and lovely main restaurant serving very good breakfast, lunch and dinner. Food is very good with lots of choice always available. Excellent hotel, can't ask for anything more. Would definitely choose this hotel again. Thank you Aladdin Beach for an enjoyable stay. В Аладдине мы не первый (и не второй:) раз! Поэтому сразу хочу начать с благодарности вчем сотрудникам отеля за прекрасный месяц на море! Были с мужем и детьми 17 и 4 лет и младенцем 10 месяцев. Остались довольны все! Огромное спасибо менеджеру Кариму, уладившему недоразумение, врзникшее из-за моей ошибки, всем поварам за прекрасное питание, садовникам за ухоженную территорию, всем за чистоту на пляже и в ресторане! Хотела сначала написать об изменениях, которые произошли за несколько лет нашего отсутствия, но передумала :) Оставляю только слова благодарности! Спасибо! Скажу только, что зменения только положительные. Отдельный приятный бонус - это аквапарк! Мы с удовольствием вернемся еще! Aladdin Beach Resort This rating is a reflection of how the property compares to the industry standard when it comes to price, facilities and services available. It's based on a self-evaluation by the property. Use this rating to help choose your stay! 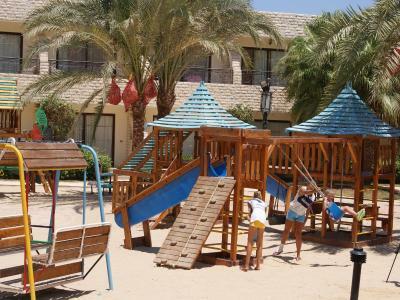 Located in Hurghada, 10 miles from New Marina, Aladdin Beach Resort has a number of amenities including a private beach area, an outdoor swimming pool and a garden. The property features a terrace, as well as a shared lounge. The property is 10 miles from Giftun Island and 1.5 miles from Senzo Mall. All guest rooms in the resort are equipped with a flat-screen TV with satellite channels. Featuring a private bathroom, certain units at Aladdin Beach Resort also offer a balcony. The rooms at the accommodation include air conditioning and a closet. A buffet breakfast is served every morning at the property. At Aladdin Beach Resort you'll find a restaurant serving International cuisine. A halal option can also be requested. The resort has a playground. You can play ping pong at Aladdin Beach Resort. With staff speaking Arabic, German, English and Italian, guidance is available at the reception. Hurghada Grand Aquarium is 5 miles from the accommodation, while Sand City Hurghada is an 11-minute walk from the property. 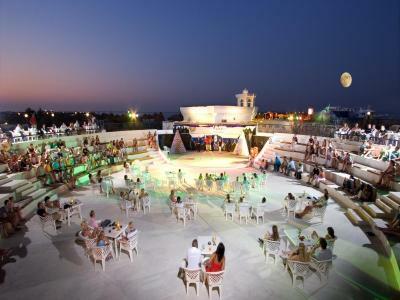 The nearest airport is Hurghada International Airport, 8 miles from Aladdin Beach Resort. 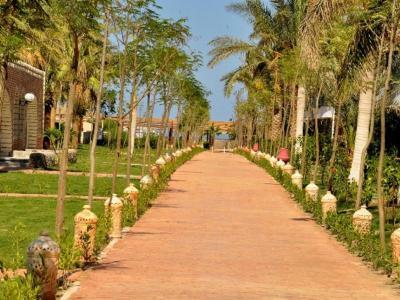 When would you like to stay at Aladdin Beach Resort? This bungalow features a seating area, satellite TV and tile/marble floor. This twin room features a balcony, mini-bar and sofa. House Rules Aladdin Beach Resort takes special requests – add in the next step! Aladdin Beach Resort accepts these cards and reserves the right to temporarily hold an amount prior to arrival. Please note that the rate for the Special Offer - Egyptian and Residents Only room is exclusive to Egyptians and residents only. Additional charges are applicable if a valid Egyptian ID, Egyptian passport or Egyptian residency is not presented upon check-in. Please note that this is a family hotel. Groups of friends cannot be accommodated. Staff. I had problem with confirmation on booking ("booking" confirmed my reservation, but hotel didn't saw it) so I waited untill some guy finish his lunch and after check what happend. So, I waited with my family for 40 min. Also, cleaning is not their strong point. The cleanliness of the hotel is 50%, especially the restaurant, also the system there is not good Some of the stuff especially on the bar and the beach, they are so annoying, all they want is touch the foreign girls , and they don’t know their limits!!! Everything!!!! - Booking.com didn't send them the confirmation email, accordingly I had to wait for 2 hours to check-in - the reception manager is the Worst person that you will ever meet,he is a jerk, rude, who doesn't know the BASIC principles of dealing with people - the food is disgusting, I had seen a fruit salad completely oxidized! - there was food that we didn't even recognize was it chicken or meat, it was literally tasteless - we found dust on the floor at the very first day of check-in - the doors of the rooms can be easily opened as there is NOlocks My advice don't go there, and PLEASE don't use booking.com as they are unreliable as well.